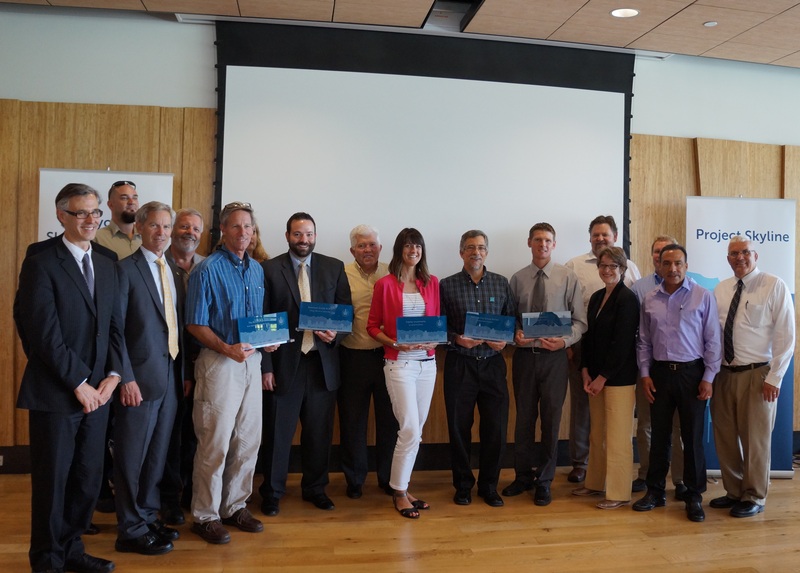 Today, Salt Lake City Mayor Ralph Becker, Kathleen Hogan, Deputy Assistant Secretary for Energy Efficiency for the U.S. Department of Energy, and Matthew Dalbey, Director of the Office of Sustainable Communities for the U.S. Environmental Protection Agency, joined City leaders and building owners in honoring the winners of the Project Skyline Mayor’s Challenge 2015 Awards. Project Skyline, a multi-year challenge to reduce building energy use in buildings across the city, was launched in May 2014. The goal is to challenge building owners across Salt Lake City to proactively meet – and exceed – the air quality and energy-saving targets of the Sustainable Salt Lake – Plan 2015 by 15 percent by 2020. Throughout its first year, Project Skyline has been overwhelmingly successful, hosting educational and networking workshops, providing resources for evaluating the building’s energy use, and helping establish energy-saving goals for each business involved. At the 2015 Project Skyline Awards Luncheon, five winners were recognized for their leadership in Challenge efforts over the past year. This year, the Energy Innovator Award goes to Basic Research. Basic Research has improved the efficiency of their 230,000-square-foot facility by improving the lighting, HVAC systems, and installing the largest privately owned solar photovoltaic project in the state of Utah. By making these improvements, Basic Research has improved their ENERGY STAR score from 10 to 99. The Sustained Excellence Award goes to Fidelity Investments. Across the country, Fidelity Investments is working to obtain LEED certification in 65 percent of their buildings and their location on 49 N 400 W is no exception. The building falls under LEED Silver certification, and recently, they added LED lighting and lighting controls and photovoltaic panels to improve the building’s ENERGYSTAR score to 96. The McGillis School, a private co-ed school located on the Northeast bench of the Salt Lake Valley, has earned the Most-Improved EnergyStar Score Award. In 2014, the school reported an ENERYSTAR score of 97, which marks a 17 point improvement from 2013. The Energy Efficiency Leadership Award goes to Newmark Grubb ACRES. Throughout the past year, Newmark Grubb ACRES has helped tremendously attending and presenting at multiple workshops. Company leadership also participates on BOMA Utah’s Energy and Sustainability committee and helped launch the BOMA Utah Kilowatt Crackdown. Additionally, the company is working on energy efficiency in several of its properties and are continuing to improve their ENERGYSTAR scores. Lastly, the Benchmarking Champion Award goes to the Salt Lake City School District. Since 2009, the Salt Lake City School District has begun benchmarking to monitor energy consumption in over 40 buildings. Not only are 72 percent of the district’s schools benchmarked, but they are also certified ENERGY STAR buildings. They have seen an an 18 percent improvement in ENERGY STAR scores in all of their buildings. Congratulations to these businesses. For more information on Project Skyline and the Mayor’s Challenge, visit our website.